everyone is different as we all deliver the club diff to the ball. Some need more loft vs. less. Ideal loft is dependent on the greens you play and the length of a putt. There is no idea loft for one kind of stroke. It is more dependent on length of putt and external conditions and how you deliver the club to the ball. Well, you're definitely hitting it on the upswing. If you play slow greens or perhaps the greens are not as manicured as well as good clubs, that's probably not a bad thing-gets the ball up above the grass. 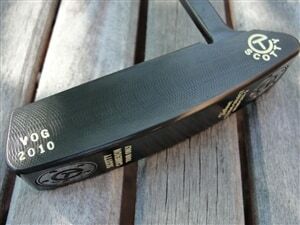 Just 10-15 years ago pros looked at loft on their putters differently. Scotty has told me pros used more loft on Bermuda to fight the grain, and less loft on Bent (the last thing you want is the ball up in the air and rolling fast on speedy Bent greens). Today the agronomy on tour is so good and so consistently there is not a lot of adjustments. And there is less loft on today's putters as a result.